These magnetic strips hold beverage bottles suspended from the ceiling of your fridge. With these clever fridge storage strips, your bottles will hang out in a cool loft that might make the orange juice jealous. Each strip features three super-strong neodymium magnets--two strips secure a six pack of your favorite beverage bottles to the ceiling of your refrigerator, keeping them handy and freeing up space for other food that's just chillin'. The strips adhere to any spot with heavy-duty peel-and-stick adhesive. Made in Charlotte, North Carolina. Includes 2 magnet strips. Each strip contains 3 magnets. This product was installed in the "beer fridge" of my son-in-law. Space-savonig and a cool looking result. While e-window shopping I saw these. It is that perfect gift for my family who homebrew and bottle on the weekends. Saves space in refrigerator and makes it easier to select type. They loved it! It's like a storage unit for your fridge! Great for the main fridge or spare garage fridge. Really helped to store beverages more efficiently in our outdoor refrigerator. Hanging beverages from the ceiling of the refrigerator allows you to store canned or smaller beverages underneath. The magnet strips are strong and worked just the way they were described. Going to put it in the frig-it will look great for parties. Love this product. My husband is delighted to be able to keep bottles out of harm's way in the fridge. The magnets are a little pricey, but they are worth it! I would even consider purchasing several more of these magnets! I HAVE bought this product AGAIN! This gizmo is truly a favorite of mine. 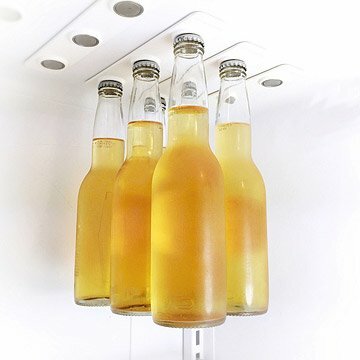 BottleLoft's strong magnets hold soda or beer (by the caps) from the "ceiling" of the fridge, making more room on the shelf, and it looks modern, organized and great! I had to buy a new fridge and couldn't pry the strips off the old one. That's how strong they are. So I just bought more new ones! Had to Buy Them Again! I normally wouldn't pay this much for a product like this, but I have a small space for a fridge, so any help in organizing the fridge is welcome. These strips allow room under the hanging bottles for more foodstuffs, and I love how handy they are. And DURABLE. (I wasn't able to remove them from the old fridge when they carted it away.) They're worth every dollar IMO.